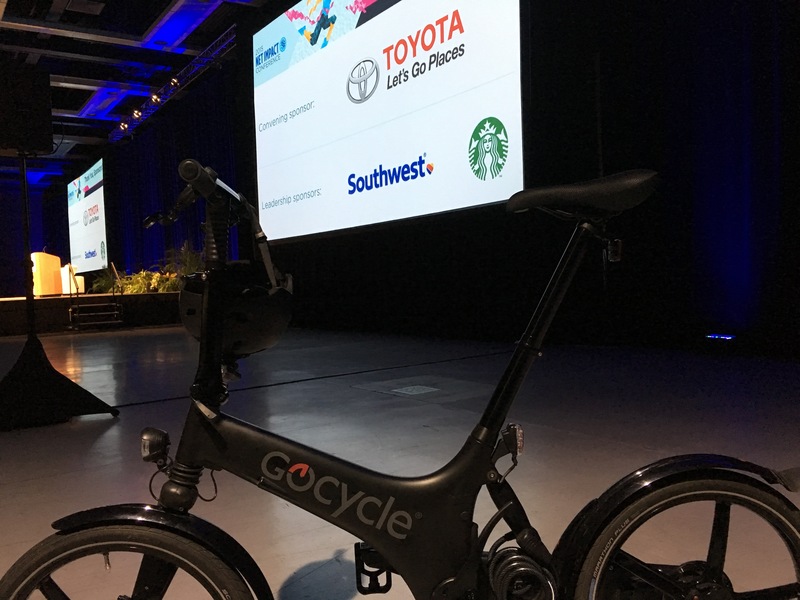 Five minutes before I was about to go on in front of 2,000 people, I had only a vague idea of what my two guests — the CEO of REI and the President of Starbucks — were going to say in their keynotes. Which meant I had better have my thoughts organized even as I took the notes that would inspire our follow-up conversations. I’ve spent so much of this year on-stage — from Oregon in January with TEDx OSU and Intel, through to Seattle with a number of signature turns with Microsoft, the Chamber of Commerce, Town Hall, Impact Over Easy on to Hamlet’s castle in Denmark for Transition World and then to the United Nations General Assembly for the Millennium Campus Network. As it’s all about a high-wire, high energy performance, what I take up there to support me, I take seriously. I’ve chosen my gear very carefully. Now as the year closes, my latest recent keynote session for the annual Net Impact conference has confirmed my configuration, which is worth sharing for those who like to perform on-the-fly. I woke up 15 minutes before my Microsoft Band was set to vibrate. Despite owning a variety of caffeine-delivery devices, my morning beverage of choice involves pouring boiling water over instant coffee. I had already selected my outfit: slim-fitting, breathable and mostly water resistant. But post-shower and pre-suiting up, I took a few minutes to review my remarks and printed out a hard copy, just in case technology failed me in the heat of the moment. I filled up my Grayl filtered-water bottle and headed to the garage. However, technology DID fail me before I even left the house. I had relied on my Weather Channel app to inform how I would get to the Washington State Convention Center that morning: a dry day, perfect for a clean, simple bike commute. But I opened the garage to face the worst of Seattle’s ironic precipitation: a drenching mist. If I weren’t taking to the stage in two hours in front of a hall full of business students and social responsibility professionals, I wouldn’t have troubled myself with a bit of rain. But I didn’t have the luxury of time to dry off that parts that would be highly visible under the lights and on the big screen. I nearly ran back inside to get my car keys. I despise driving in this part of the world for two reasons: traffic and me. As my friend Eric Liu likes to say, “you’re not stuck in traffic, you are traffic.” And when I’m headed off to a high-profile engagement, driving just ratchets up my stress level. I’m quite profane in the driver’s seat. On the bike seat, I accept the vicissitudes of life and embrace my independence, a more suitable state-of-mind for emitting a positive energy at the head of a room. Here’s what my morning looked like. I drank my instant Starbucks VIA coffee. I “hash tag” #OPTOUTSIDE , threw on this outfit, which includes my wool bike pants that I bought from REI and biked to the Convention Center. 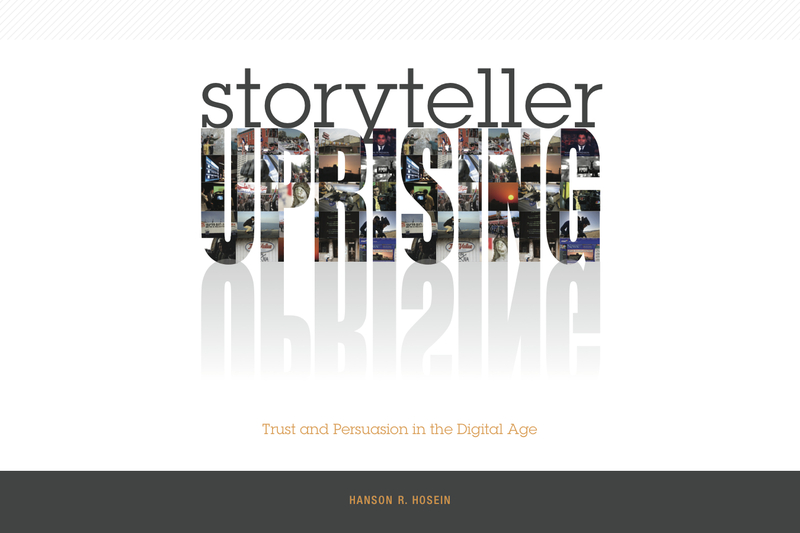 It’s also the heart of the value proposition of the Communication Leadership master’s program that I lead at the University of Washington: using dynamic story to influence change and inspire action. 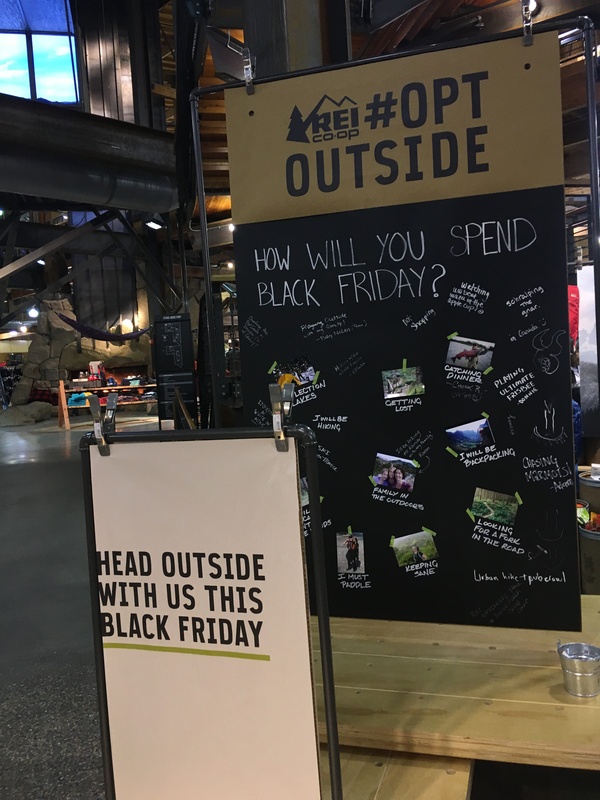 And I’m proud to say that three of my former students were directly involved in the #OPTOUTSIDE campaign that has gotten the country’s attention, when our first speaker, REI CEO JERRY STRITZKE announced that his retail cooperative would close its stores for Black Friday. So I hastily pulled on my waterproof bike pants (REI of course) and coat, and set off on my bike, with the latest Audible download of the New York Times playing through my earpiece. Less than thirty soggy minutes later, I walked right into the Convention Center and headed to the huge hall to connect with the session’s organizers. I brought my bike directly backstage with me. It’s a greaseless “Cleandrive” folding e-bike from the UK that usually doesn’t get a second look from security guards and receptionists. Over the past year, thanks to online retailers such as Huckberry and GovX, I’ve discovered that there are a number of small, fashion start-ups that are producing (often in the United States) some unique items for bike commuters who need to hop off the bike and into a board room (or onto a stage). “Fast-drying” means “shedding precipitation” as well as “sweat management.” So I’m thrilled with t-shirts from Ministry of Supply (Boston-based MIT graduates), my waterproof leather footwear from Boston Boot Co. (which began as a Kickstarter campaign), vented work shirts from Parker Dusseau (Bay Area brio), and as always, my merino wool caps from Ibex and my recycled bike tube belts from Seattle’s own Alchemy Goods. Indeed, a few sharp-eyed attendees at this Net Impact keynote session noticed my Alchemy Goods “AG” sticker covering up the “Lenovo” logo on the back of my essential on-stage device: a Windows 8” tablet. I primarily use Apple hardware, but when it comes to a fluid public situation, I want to have instant access to my research (which is why I swear by Microsoft OneNote for this, it has superlative usability), AND I want to handwrite anything that occurs to me in the moment. That was especially needed at this event because I had very little advance notice as to what my two guests from REI and Starbucks were going to say (I had been told I’d have their visuals the day before — that never happened). 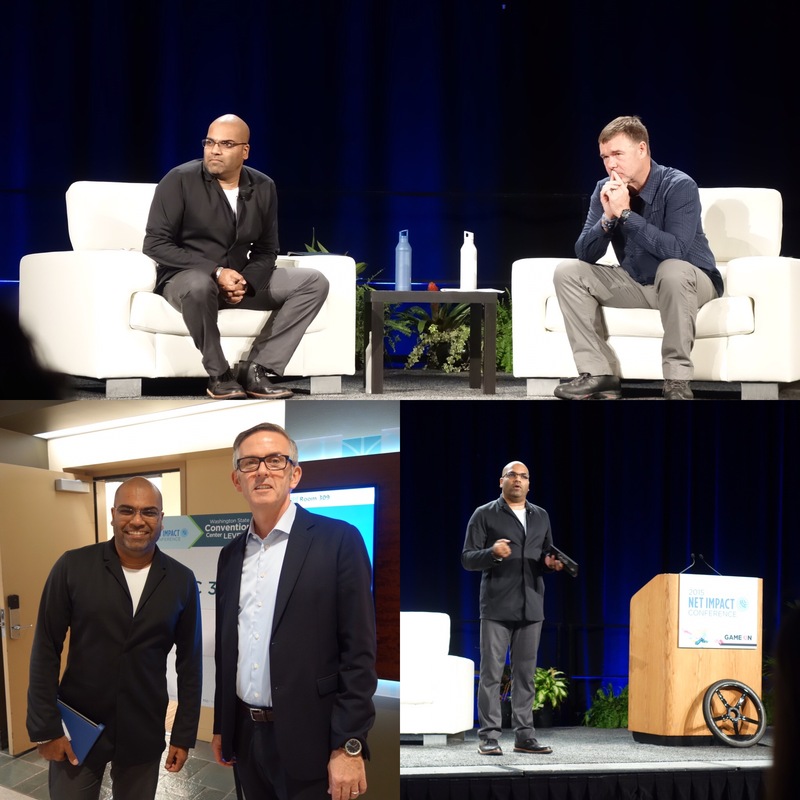 So I had to listen carefully to their respective 10-minute keynotes, and write down a few ideas to follow-up on when I interviewed them afterwards. Thanks to Lenovo’s seemingly discontinued “Anypen” technology, I could do so with a sharpened Dixon Tri-Conderoga HB #2 pencil (who needs a $100 Apple Pencil?). I switched my other connected devices into “Airplane” mode to avoid any distraction (my officemates and I are now avid users of Slack as an internal communication platform), as well as any interference with the wireless mic. We only had an hour for two keynote presentations, my questions to the two executives, as well as audience Q&A so I relied on the analog — my large-face Filson watch, assembled in Detroit — to keep time. After all, thirty minutes later, I was due to host a much smaller roundtable session with our Starbucks speaker, Cliff Burrows. Judging by the number of attendees who approached me afterwards with appreciation following these sessions, I guess I made the right choices, both editorially and with my furnishings. I also later found out how the Oakland-based Net Impact organization originally found out about me as they sought out a moderator for this keynote: through a web search for Seattle-based journalists who have gone toe-to-toe with A-list leaders, they found my on-camera interviews with Starbucks’ Howard Schultz and Amazon’s Jeff Bezos. It’s further confirmation that how we nurture and curate our content and connections are key to future opportunities (through posts such as these and by using Evernote’s handy business card imager tied to LinkedIn). It also doesn’t hurt to aspire to grace under pressure and to dress the part.